Find out everything you need to know on the new BMW 4 Series from independent vehicle review website Car And Driving. You can watch the video review to the left to see more of the car or read their written review below to get a true insight from an expert in the automotive industry. The BMW 4 Series Convertible continues to provide executive segment buyers with folding hard top option in the cabriolet class and offers smarter looks in this improved form. Jonathan Crouch reports. BMW's improved 4 Series Convertible perseveres with a neat metal-folding roof that offers a different option to executive segment cabriolet buyers not already swayed by the competing charms of rival open-topped versions of the Audi A5 and Mercedes C-Class. You won't get the large boot and cutting-edge driving dynamics of the 4 Series Coupe, but compensations come in the form of refinement, security and drop-top desirability. In short, you'd like one. It's the thing that makes a BMW handle like a BMW should. I'm talking of the brand's famous 50:50 weight distribution. That's something the Munich marque makes possible by the almost unique rear wheel drive configuration it applies to most of its models but with this car, puts at risk than with any other design in its line-up. Welcome to the 4 Series Convertible. The reason for that is also the main reason why you might buy this car - its metal folding roof. Alone in the executive convertible segment, BMW continues with this arrangement, rather than the soft-top fabric roof mechanisms rivals Audi and Mercedes use. It's a unique touch that'll tempt people liking the security, refinement and pavement wow factor of a folding metal top. But the system weighs a quarter of a tonne and needs complex, heavy mechanicals that must be very carefully positioned to maintain that perfect weight distribution I mentioned at the beginning. Does it make sense in this smarter, lightly facelifted 4 Series Convertible? Let's find out. Is the average BMW 4 Series Convertible customer going to approach this car wanting to sling it around a bit? Provided the variant in question isn't the hot rod M4 version, I suspect not. Still, if you do like your driving, you'll be interested to hear that dynamic changes made across the range mean stiffer suspension and an upgraded steering set-up. These measures have resulted in a tangible improvement in both lateral and longitudinal handling properties, regardless of the load on board. The upshot is reduced roll, more neutral responses when driving at the limit, even greater straight-line stability and the wonderfully precise steering for which BMW is renowned. This applies to the standard suspension, as well as the M Sport suspension and Adaptive suspension. On to engines. Diesel-wise, this means a choice of three units, starting with the 190bhp unit found in the 420d. Above that come the six cylinder diesel models, the 258bhp 430d and the 435d diesel range-topper with a hefty 313bhp at its disposal. Petrol people get a 2.0-litre unit developing 184bhp in the 420i and 252bhp in the 430i. Above that sit two six cylinder derivatives, the 326bhp 440i and the 431bhp M4 performance model. The xDrive 4WD system is an option on 420i, 420d and 430d variants and standard on the 435d. But I haven't yet talked about the roof. If the sun comes out or the heavens open, it's nice that you don't now have to stop at the side of the road to either retract or erect it, though you do have to slow to a speed of below 8mph for the 20 seconds the three metal panels take to assume their necessary positions. When the top is up, the refinement you get is indistinguishable from that you'd expect to find in the 4 Series Coupe model, thanks to a number of design improvements made to this Convertible version. These include a sound-absorbing headliner that reduces wind noise by up to 2dB. BMW alone persists with the metal-folding roof concept in this segment, so if you prefer this 4 Series Convertible to either of its two direct rivals, Cabriolet versions of the Audi A5 and Mercedes C-Class, that's likely to be the major reason why. The changes made to this revised model are really quite subtle. If you know the car well, you'll spot the new twin LED headlights that now come as standard. Another frontal change is found in the central air intake which has an aperture that increases in size towards the outer edges, adding a more imposing presence and greater sense of width to the entire nose section. Otherwise, the recipe is as it was before. Having to create a pretty shape that effortlessly swallowed all the roof-work's sliding metal panels must be quite a design challenge but here, that's been expertly carried off, helped by the fact that like all the most modern folding hardtops, the BMW system - which takes 20 seconds to operate and can function at speeds of up to 8mph - uses three rather than two-pieces. The advantage of this is that you don't need a distended rear end on the car to accommodate the larger sections of a two-piece roof. The downside of stacking three rather than two pieces on top of each other in the boot is that when they're all folded and sandwiched together here, there's not a great deal of luggage space left. With the roof up, you'll get 370-litres of cargo capacity. But fold it down and that figure falls to just 220-litres. And the rear seats? Well, getting to them isn't the easiest task in the world and once you're seated, there's just about enough room for two adults on shorter trips. At the wheel, there's a low-set driving position and a grippy three-spoke sports steering wheel. Optional on this car is the Air Collar, a concept first pioneered by Mercedes, with vents below the head restraints that can massage your neck with comforting warm air on cold mornings. Otherwise, everything is as it would be in a 4 Series Coupe. Expect to pay somewhere between £38,000 to £50,000 bracket for mainstream 4 Series Convertible models - though you could pay over £60,000 if you want to consider the desirable M4 flagship variant. If you're comparing against an equivalent 4 Series Coupe with the same engine, that means a drop-top premium of between £4,000 and £5,000, depending on the variant you're looking at. Most customers will be browsing at the bottom of the range where both the 420i and 420d models put out 184bhp and 190bhp respectively but if you choose the diesel version, there's a premium of around £2,500 to find over its petrol equivalent. With all the four cylinder models, you're also looking at about £1,500 more if you want to specify 8-speed automatic transmission many will want. That's standard on the 440i petrol and six cylinder diesel models but then, for the kind of prices these variants command, it probably should be. Equipment includes the power-folding roof of course, plus all variants get the iDrive infotainment system with its 6.5-inch colour screen, automatic xenon headlights with heated washers, front foglights, smart alloy wheels of at least 17-inches in size shod with run-flat tyres, heated door mirrors, an alarm, Park Distance control at the front and the back, rain sensing wipers and a Hill-start Assistant to stop you from drifting backwards on uphill junctions. Inside, there's leather for both the heated electric front seats and the multifunction three-spoke Sports steering wheel, dual zone air conditioning, cruise control, an auto-dimming rear view mirror, a trip computer, Bluetooth 'phone compatibility and a decent quality six-speaker 'BMW Professional' stereo system with a digital radio with USB and Aux-in points. You also get the Drive Performance Control set-up that enables you to tweak steering and throttle response to your mood - though you can get a bit more from that system if you pay extra for the Adaptive suspension. Can this really be seen as an efficient car? After all, it carries around a very inefficiently heavy roof mechanism. A BMW 320d saloon weighs 1,495kg: the 420d Convertible weighs 1,755kgs. Those are the facts - and they go much of the way towards explaining why metal folding roofs have fallen from favour the in current, efficiency-obsessed automotive design. Having said all of that, the Munich maker is keen to point out just how much effort has gone into minimising the downsides of this approach with this car. The result of a whole range of EfficientDynamics tweaks is that BMW has kept the running cost penalty of opting a 4 Series Convertible over a 4 Series Coupe to around 10%. 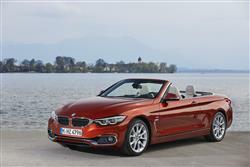 The manual gearbox 420d Convertible manages 55.4mpg on the combined cycle and 134g/km of CO2 in manual form. As for pokier 4 Series Convertible diesels, the 430d manages 51.4mpg and 144g/km. Even the top automatic-only 435d xDrive model with its standard 4WD system gives you 47.9mpg and 155g/km. On to petrol power. A 420i Convertible manages 42.8mpg on the combined cycle and 153g/km of CO2 in manual form. With the 430i, you can expect 40.4mpg and 162g/km in manual guise. On that basis, it's hard to justify the six cylinder 440i variant. It goes hardly any faster than a 430i, yet costs far more to run, delivering 39.2mpg and 167g/km. That only leaves the flagship version of this car, the potent 431bhp M4 variant. In its most efficient automatic form, this car can manage 32.5mpg and 203g/km. Would this car be a more engaging driving machine without its weighty roof mechanicals? The extra sharpness of its 4 Series Coupe stablemate certainly suggests that. I sense though, that most buyers of this open-topped version will be quite happy with a more relaxed, comfortable demeanour. That is, after all, as much as competitors from Audi and Mercedes offer - and those brands can't deliver the engine choice BMW provides here. In fact, a lot of boxes are ticked by this car if you can afford its asking price. You get impressive safety systems, high residual values, above average rear seat legroom and a sheer depth of engineering that rarely fails to impress. As a result, in many ways, it could be seen as the most complete contender in this segment and, best of all, it looks as striking and expensive as a convertible of this kind should when the sun's out and all is right with the world.